Well, I love it anyway. In that, super-annoying, I-wish-I-didn't-work-outside-the-home-so-I-could-actually-have-time-to-do-some-of-this-stuff sorta way. 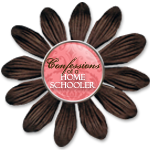 It's a homeschooling blog. And before any homeschooling haters tune out, just keep reading, 'kay? I don't remember how I found it. I manage to stumble across about 2-3 new blogs a week, most of which I decide aren't worth my time. When I found this one I was intrigued, as FireMan & I are keeping homeschooling an option for FireGirl, but didn't have time to really read it yet. So I bookmarked it for later. When I finally had time to check it out, I found lots of cool stuff. Educational crafts for little ones, some of which FireGirl can do now. Recommendations on educational toys and other educational tools & items. Ideas. Stuff that I love. Things that I want to do with FireGirl. So I kept it bookmarked, with the idea that when I know FireGirl & I will have significant free time (what's that?) together, I'll plan to do one of the educational crafts or activities. As of yet, that time has not emerged, but I'm not giving up just yet. I'm also considering sending the link to a couple of friends who provide in-home daycare. I figure if not now, then eventually they'll be looking for new ideas for activities, right? Just timid because I don't want to step on any toes, especially considering one of these friends is currently watching FireGirl part-time. Anywho... that's one of my new blog loves. Hope you find some value in it too!